This supplement contains Magnesium and L-carnitine L-Tartrate which impact the frequency and severity of migraines. Migraine is an episodic brain disorder, characterized by unilateral throbbing headache lasting from 4 h to 3 days. Associated symptoms include nausea, vomiting, and sensitivity to light, sound and head movements. In migraine and tension headache sufferers, low levels of blood, blood cells, and saliva magnesium have been reported. 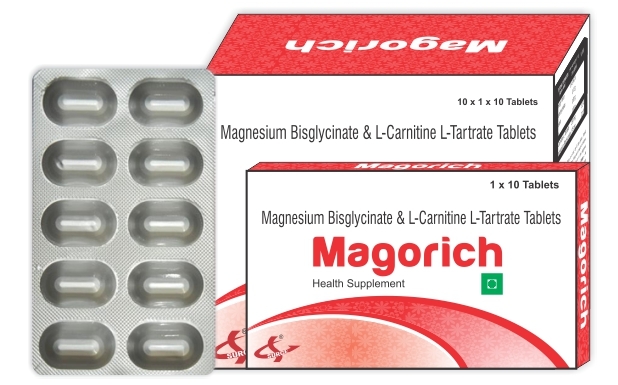 The two natural substances, magnesium and carnitine are very effective and useful in migraine headaches. These supplement target the underlying mechanisms of migraines, improving brain blood flow and restoring balance to the brain chemicals neurotransmitters. In this combination, Magnesium plays an important role in mitochondrial energy production, and magnesium deficiency can lead to many physiological changes, including cerebral artery spasm and increased release of pain mediators. Besides, low serum concentration of Carnitine especially in dialysis patients had been reported as the migraine trigger. Carnitine is a major component of mitochondrial function and thought to also to be a protective molecule to the brain tissue. Mitochondrial dysfunction, which leads to impaired oxygen, metabolism, has been speculated to play a role in migraine pathophysiology by influencing neuronal information processing, and migraine patients have been shown to have a reduction in mitochondrial phosphorylation potential between headaches. So Magnesium and Carnitine significantly decreased the migraine indicators and improves mitochondrial function for preventing migraine. It is an essential element and is needed as a co-factor for more than 300 biochemical reactions in the body. It controls normal adenosine triphosphate function, glucose metabolism, nucleic acid synthesis, and a variety of other cellular functions. It also has involvement in skeletal and cardiac muscle function, cytoskeletal contraction, control of vasomotor tone, and neurotransmitter release. When it comes to treating and preventing migraines, magnesium is able to improve brain blood flow and to help balance the brain's neurotransmitters. It also has beneficial effects on the balance of excitatory to inhibitory neurotransmitters. Magnesium is a natural blocker of the excitatory receptor on brain cells, so when ample magnesium is available those receptors don't trigger the excitatory electrical impulse. This allows the brain to move into its more balanced, calm mode. L-carnitine is an amino acid (a building block for proteins) that is naturally produced in the body. It is necessary for fatty-acid metabolism and energy production. Carnitine is found in almost all of your body's cells and is particularly concentrated in skeletal tissue. It plays a crucial role in helping your body burn, or oxidizes fat for fuel, so that our body can use fat as an energy source. Carnitine transports long-chain fatty acids into specialized fuel manufacturing centers called mitochondria. Once inside, the mitochondria can burn the fatty acids to produce energy. In addition, carnitine transports toxic compounds out of the mitochondria to prevent accumulation. Pregnant and lactating mothers should not take any single supplement in higher-than-normal doses unless recommended by a health-care provider for a special condition. The combination should only be used in pregnancy and lactation if benefits outweigh the risks. Stay on the safe side and avoid use.